The new £21 million bus and Tyne and Wear Metro interchange at South Shields is progressing with the roof now having been installed. The project to build the new interchange started earlier this year and is Phase Two of the £100 million South Shields 365 regeneration masterplan. As we reported earlier this month South Shields Metro station is closed for five weeks whilst this work is taking place with services instead terminating at Chichester until Saturday 3rd November. The full interchange is due to be completed by next summer after which the current Metro station will be demolished. With South Shields currently closed trains are terminating at Chichester. 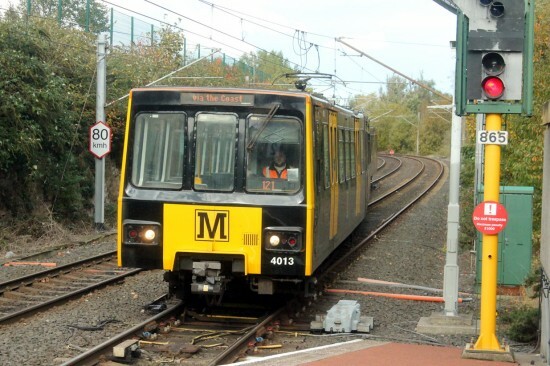 This sees the trains using the usual South Shields bound platform to terminate before they pull forward and then use the crossover to access the correct platform. 4013+4014 show the move here for us as they approach Platform 2 over the crossover ready to return towards Newcastle.